Though sometimes dismissed as a disappointing compromise between the two phases of Chrome’s musical output—the delirious, expressionist SF punk cut-ups of Alien Soundtracks (1977) and Half Machine Lip Moves (1979) and the more “traditional” LPs that followed, like Blood on the Moon (1981) and 3rd From the Sun (1982)—Chrome’s fourth LP, 1980’s Red Exposure, could scarcely sound more uncompromising, resembling as it does the titular exposure to some kind of corrosive cosmic field. The definitive version of Chrome, with at its core Damon Edge and Helios Creed—who remained the only stable members until the band split in 1983—came into being in 1976, and emerged from the same San Francisco static as The Residents and MX-80. They were possessed of a sound and approach at least as idiosyncratic as those of their peers: one that combined the clanking, loping, mass-produced rhythms of dystopian futures with Edge’s inspired vocal and synth experiments and Creed’s SETI guitar heroics. With melodies often driven by thick, almost dub-like bass, Chrome sound like a boogie band being accidentally transmitted into the white-hot drive chamber of a starship’s engine. 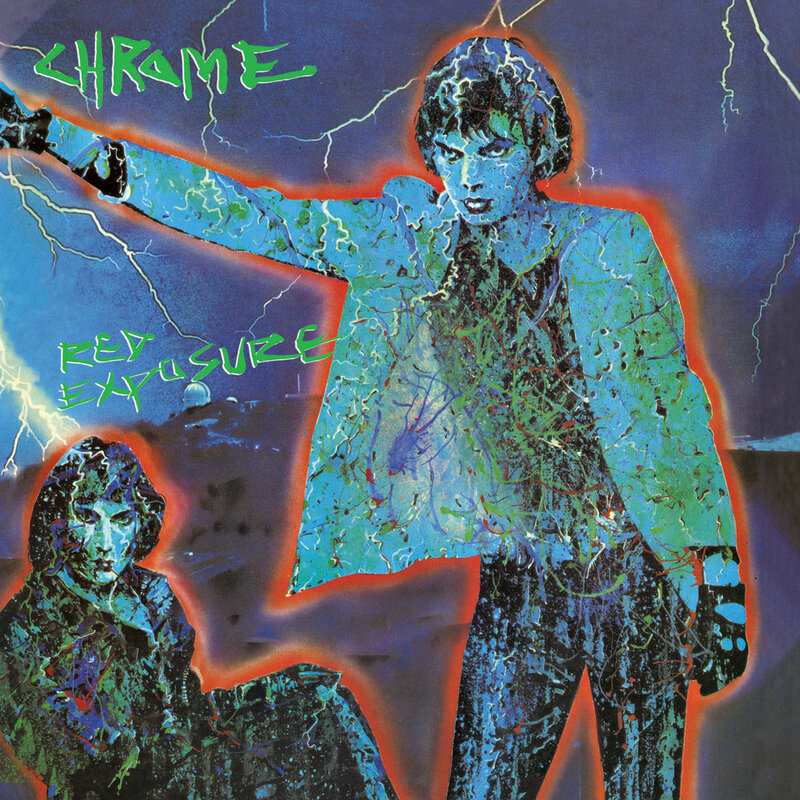 In their songs and lyrics, as well as their LP covers (and the cover of Red Exposure is either impossibly gauche or impossibly ballsy), Chrome almost always seemed to be expertly and deliberately straddling the line between a kind of jejune rock ‘n’ roll literalness and an oblique, acid-addled sophistication—playing with the dissonance between disenchanted pessimism and the youthful need to exploit possibility, however strange and worrying. It is the tension between these two facets that fuels them: childlike dreams of the future eroded from within as we watch by inevitable corruptions. 1980 was the year that Marilyn Ferguson’s The Aquarian Conspiracy—one of the books often cited as having done much to shift “new age'” ideas into the popular mainstream— was first published, and Red Exposure begins with Chrome’s riposte: New Age, whose deceptively calm opening turns unnerving as soon as Creed’s Roentegen guitar makes its appearance, quickly followed by Edge’s disturbingly pitch-shifted vocals, which slide up and down the scale like a cast of roaring, gabbling alien characters and the two-note chime that sounds throughout the song like a warning system. The babbled or chanted lyrics are hard to make out, but clearly this is not the peaceful New Age of crystals and meditation: “I’m on the outside, looking at the inside—nobody inside looking at the outside,” sings Edge, in the role of rock’n’roll trope (the outsider) deprived of an inside against which to define itself. In the Orwell-referencing Room 101, a melancholy arpeggio surfaces out of Creed’s MKULTRA sound torture like the memory of a past personality—before fading into nothingness, giving way to the nauseous lurch of Jonestown. Later, in Static Gravity, synthetic funk loops under bursts of guitar which vent briefly like directional thrusters, and the record ends with two miniature masterpieces of sci-fi theater: Nights of Earth, which sounds like the ominous approach to some facility housed in the deep jungle, and Isolation, whose sensory-deprived narrator, possibly the burned-out remnant of the space flight training course we hear described in the song’s intro, mumbles his aloneness over shrieking guitar blast. Throughout the record, Creed manages—as always—to transform that most traditional and often hackneyed of instruments, the guitar, into something else altogether: a multilayered arsenal of berserk aural technologies. His relative reserve on Red Exposure only makes the searing discharges of redshifted violence all the more startling when they occur. Edge too uses his voice as an instrument, his expressionistic lyrics offering a cabinet of startling characters that somehow add up to a cogent though fractured depiction of a world, like sensory-impressions extracted from the decaying brain of a mummified astronaut. Despite its age, Red Exposure‘s glistening, pulsing, slashing, scraping music and lyrics still sound like the product of an impossibly distant future or a completely alien culture, and imply tangential realities where “rock” music still possesses a function as a vibrant, transformative tool, as opposed to the sad ceremony of ritualized gestures and zombie posturing it was doomed to inhabit. If there is a recurring theme in Chrome’s music, perhaps it is humanity under the pressure—physiological, psychological, and philosophical—of the future, and Red Exposure conveys perfectly the tension of standing on a tightrope over a chasm of multiple destinies good, bad, and incomprehensible, and staring down upon them in hysterical awe. It must be heard.